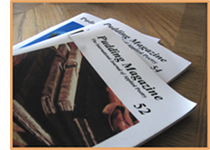 Pudding Magazine is a small press literary publication with an emphasis on poetry, although we do sometimes publish very short fiction, essays, book reviews, art and photography. We encourage new authors to submit, but we also publish many established authors. In rare instances, we publish theme issues and chapbooks by invitation in addition to the semiannual journals. Magazines range from 60-80 pages. Our mix is eclectic, and we like it that way. Traditional, modern and experimental forms of writing are given equal consideration; we only ask for originality and excellence. Our roots are "applied poetry", so we are open to poems that address the complexities of modern life, including but not limited to political, social, and psychological issues, and how art helps us through the processes of living. Open Earth was not enough. Now after popular demand, Pudding Magazine is proud to introduce Open Earth II. Even more timely. Even more relevant. Even more to add to your Open Earth experience. Request Open Earth II at the order link. Pudding Magazine issue number 65 completely sold out within just a few weeks of publication. We are currently reviewing submissions received for issue 66, and we are excited with some of the wonderful poetry our contributors have shared. Don't get caught without your copy of Pudding 66. Place your subscription order on our subscription page today. Robert Riche's All the Days: A Memoir in Poetry. Although PM usually doesn't publish books other than anthologies of poetry and short fiction, we made an exception for Robert Riche's All the Days: A Memoir in Poetry. For one thing, we received a lot of positive mail after we featured Riche in PM #, more than any other featured poet! Then too, Pudding House, PM’s original publisher, published Riche's first chapbook of poetry. And finally, we really loved this manuscript! It's a journey through personal, political and philosophical landscapes of one man's life--and as such, brings us to a greater understanding of our own lives. Available at puddingmagazine.com or email connie@puddingmagazine.com. Also available now on Amazon.com. PM 63 is a very special issue. Featuring an essay about PM founder Jennifer Bosveld along with a dozen of her poems. Jennifer was an icon in the world of poetry and small press publishing with her powerful Pudding House Publications empire. This issue is a tribute to her contributions to writers far and wide (editors of PM included!) and the greater world of literature. Lots of great work in this issue we think Jennifer would love to read! Collectors of PM need this issue on their bookshelves. Order your copy at puddingmagazine.com or email connie@puddingmagazine.com. Connie Everett is the Editor-in-Chief and Publisher as of September 2010. 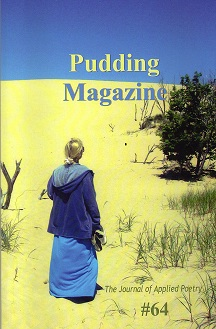 PUDDING MAGAZINE was formerly a part of Pudding House Publications. It was founded by Jennifer Bosveld in 1979. PUDDING MAGAZINE is funded solely by subscriptions and independent purchases. We do not seek grants for magazine publication. 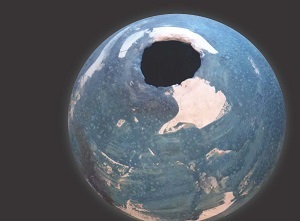 Our Mission Statement: To promote the poet in all of us, to encourage revision of perception through the creative process, to elevate our poetic sensibilities through sharing language, and to provide a sociological looking glass through poetry to identify challenges and solutions at significant moments.